In a world torn apart by persecution, war and oppression, 3 children in Fatima, Portugal were chosen by God to offer an urgent message of hope to the world. 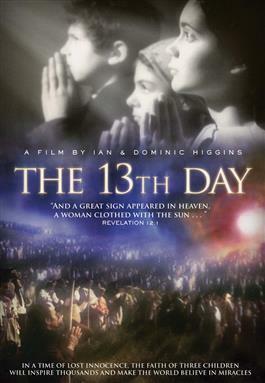 Based on the memoirs of the oldest seer, Lucia Santos, and many thousands of independent eye-witness accounts, The 13th Day dramatizes the true story of three young shepherds who experienced six apparitions of Our Lady between May and October 1917, which culminated in the final prophesied Miracle of the Sun on October 13th. Abducted from their homes, thrown into prison and interrogated under the threat of death in the government’s attempt to silence them, the children remained true to their story about the crucial messages from Mary of prayer, repentance and conversion for the world. Our Lady gave a secret to the children told in three parts, from a harrowing vision of hell, to prophetic warnings of future events including the advent and timing of the Second World War, the spread of communism, and the attempted assassination of the Pope. Stylistically beautiful and technically innovative, the film uses state-of-the-art digital effects to create stunning images of the visions and the final miracle that have never before been fully realized on screen. Shot on location in Portugal and in the UK, the film has a cast of hundreds to re-create the scenes of the 70,000 strong crowds, with 3 young Portuguese actors playing the iconic roles of the Seers. Witness the greatest miracle of the 20th Century, and experience the incredible, emotionally-charged and harrowing world of three young children whose choice to remain loyal to their beliefs, even in the face of death, would inspire thousands. Filmed in High Definition with Dolby Surround Sound. Stars Jane Lesley, Michael D’Cruze, Filipa Fernandes and Tarek Merlin. - 24 page companion Collector's Booklet with special interviews, articles, pictures and more! - Film on Fatima with Fr. Andrew Apostoli titled "Fatima: Message of Hope for Today"
"The 13th Day is the best film ever made about Fatima  the most beautiful and effective, as well as one of the most historically accurate. Sister Lucia's memories are imbued with an aura of reverie and contemplation by striking visuals, an effective score and a stark, simple narrative. A fact-based film that succeeds in being both artful and reverent is a rare thing. The 13th Day succeeds." "The 13th Day lives up to the hype we heard all summer. It leaves older film versions in the dust in terms of cinematic artistry and special effects. Directors Ian and Dominic Higgins were illustrators before they were film makers, and it shows. Each shot looks like something one could frame and hang on a wall. The miracle of the sun is depicted perfectly: it matches eyewitness descriptions more accurately than any other movie version... I have a feeling that this film will be a "Catholic classic" for many years to come." "Pope Benedict XVI has said, 'Learn the message of Fatima! Live the message of Fatima! Spread the message of Fatima!' This film is a powerful presentation of the events surrounding Our Lady's apparitions. It especially shows the sufferings that the three little shepherd children endured as God's messengers of Our Lady's peace plan from Heaven. It combines a certain dramatic intensity with an attractive and innovative artistic presentation. The result is a moving appeal to heed Mary's message which is so important for our times. I believe this film will assist the cause of the world's peace and the salvation of souls." "A remarkable re-telling of the story of Fatima, told from the perspective of Sister Lucia’s memories. A moving presentation that vividly portrays the courage of the children and the great demands made not only on them but on their families. I believe that many will be deeply touched by the film."